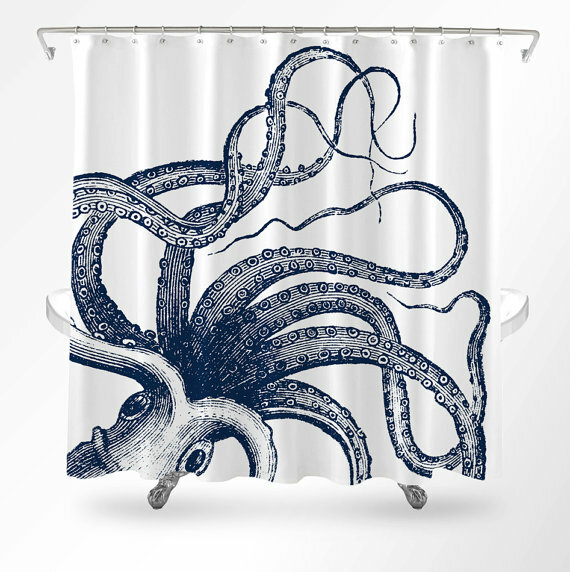 Whether you take a quick shower or soak and relax in the bathtub, you spend quite a bit of time in your bathroom, and these gadgets make your time in your bathroom more relaxing. 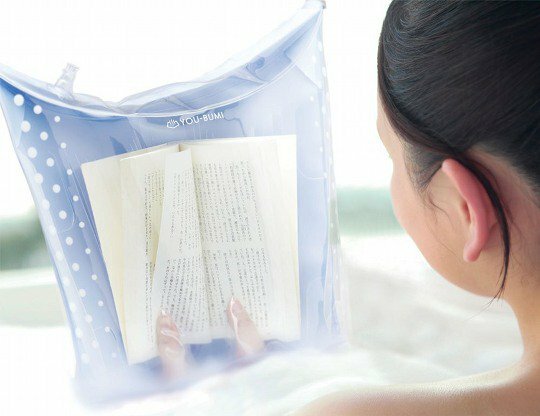 Waterproof Book Cover Bath Bag: If you are an avid reader or if you like to read while soaking and relaxing in the bathtub then You-Bumi is for you. All you need to do is insert your book into the air filled bag and use the specialslots that lets you turn the pages and keeps a firm grip. Buy Now. Foot Washer Shower Shoes: The Foot Washer Shower Shoes are designed to be worn in the shower, and lets you clean the soles along with the spaces between your toes. Buy Now. 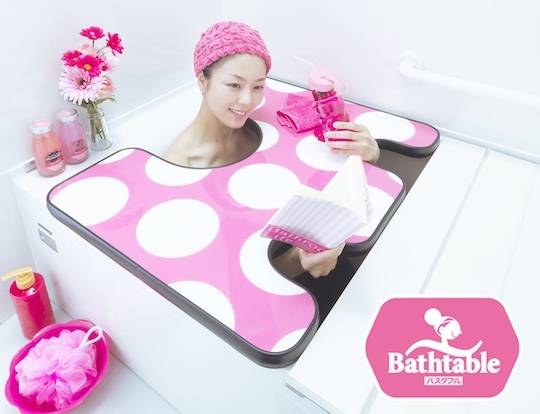 Bathtable: The Bathtable is a bathtub top table that keeps everything you want close at hand and dry. Buy Now. 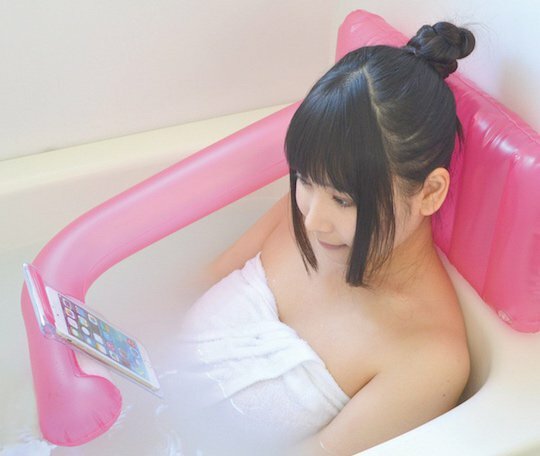 Bath Air Pillow Smartphone Holder: The Bath Air Pillow Smartphone Holder lets you lean back on the inflatable cushion and enjoy browsing on your smartphone. Buy Now. Fruit Palette Bath Light: The Fruit Palette Bath Light is just the thing you need to turn a regular bath into a more relaxing experience. 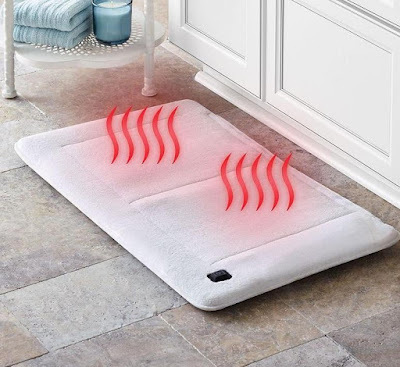 It illuminates and gives light softly and changes in multiple colors. Buy Now. 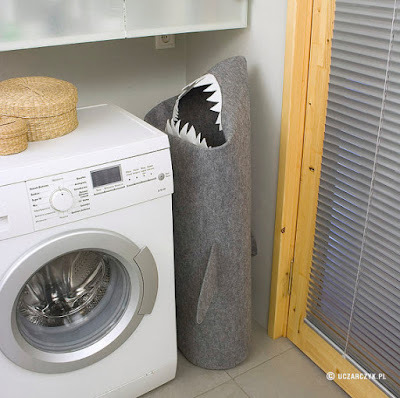 Shark Laundry Basket: The Shark Laundry Basket has a minimalistic character with strong appeal to sense of humor and yet highly functional. Buy Now. 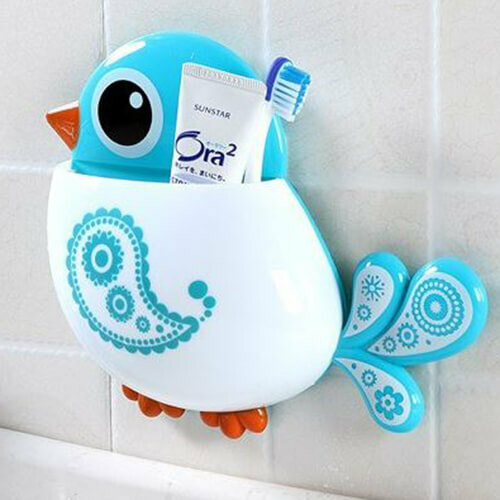 Blue Birdie Wall Pocket: The Blue Birdie Wall Pocket can be placed on your tile or mirror, and its large enough to hold your toothbrush and full size toothpaste. Buy Now. 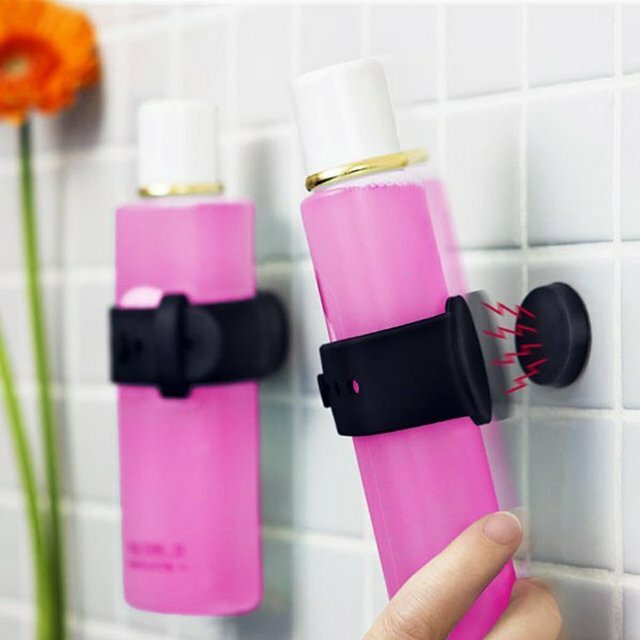 Magnetic Shampoo Wrapper: For those of us who don't own a mansion or villa, for us whose bedrooms are itself cramped then we can't have much space in our bathrooms, can we? Its just the thing when there isn't much space to keep those shampoo bottles, these magnetic holders come into action with their adjustable strap that can be adjusted on and off the wall magnet. Buy Now. 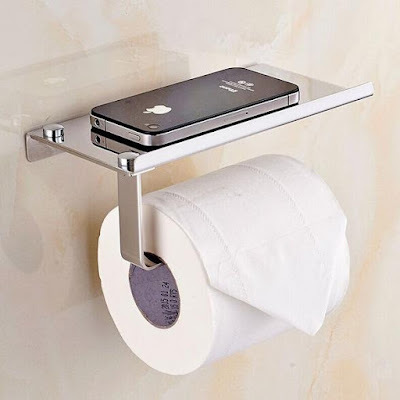 Bathroom Tissueholder with Mobile Phone Storage Shelf: We are so much into our smartphones that we don't even leave while we are busy using the toilet. And this holder comes with storage shelf, to hold your smartphone. Buy Now. 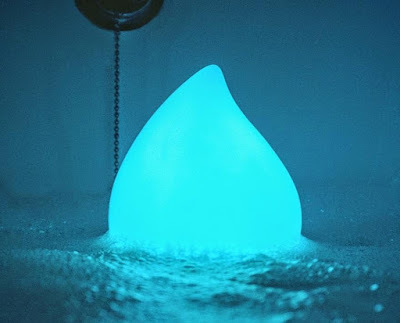 Drop Bath Light: The Drop Bath Light is a water drop-shaped lamp that illuminates when it's base comes into contact with water. This waterproof lamp floats while slowly cycling through the entire color spectrum making the bath more relaxing. Buy Now. 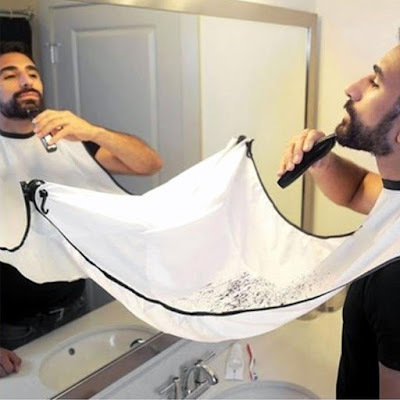 Beard Catcher Apron: If you sport a beard then you know you need to trim it every few days, and when you trim your beard you end up with facial hairs all over the washbasin and upon that you may have a clogged drain too. To make things easy and to keep your bathroom tidy and clean this Beard Catcher Apron is just the thing. Buy Now. Starwars Inspired Handheld Showerhead: This handheld shower features multiple nozzles on helmet for a relaxing spray of water. 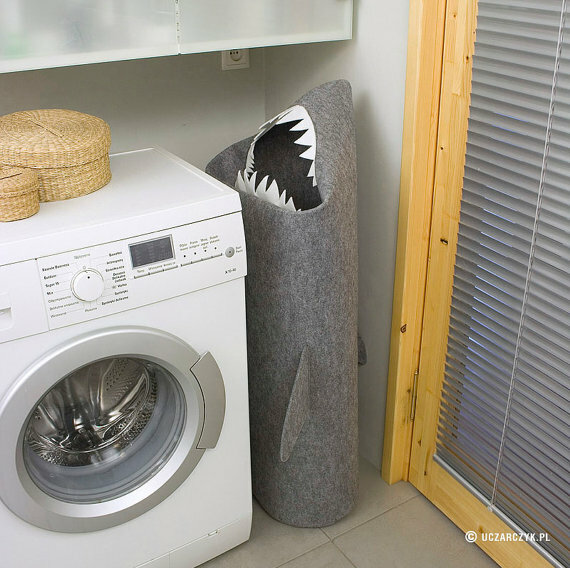 Comes with three powerful spray settings that release water from strategic points to rinse and clean faster. It features a control lever for adjusting the water pressure, anti-clog nozzles, rubber grip, and 2.0 GPM flow rate. It measures 6 inches diameter for the showerhead and 6 feet for the hose. Buy Now. 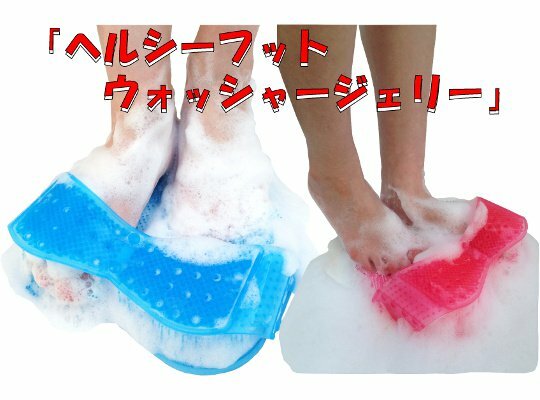 Footmate Massager and Scrubber: The Footmate Massager and Scrubber can be used in the bathtub or shower, cleans the feet and also massages them. Just put some gel (included) or soap on it and rub the foot back and forth. 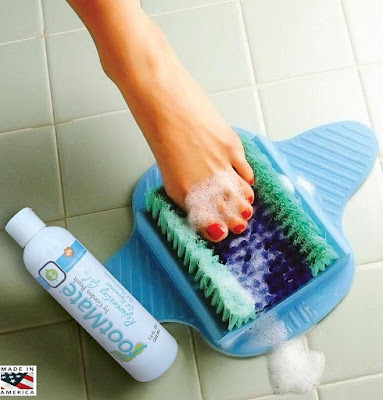 Its gentle inner brush massages the tender sole, while stiffer outer bristles smoothens rough skin and more. Buy Now.